The many parts of a restaurant experience that come together in a few short hours are always difficult to capture. Ultimately they translate to an overall whole that dictates your first words to describe the experience, and the likelihood of whether you’ll be back quickly, or ever at all. What sticks out initially is how we got to Matilda; or rather how we didn’t get to France-Soir. Thinking about an important occasion I had a sudden feeling I’d like to go back to try France-Soir so immediately Catherine called mid-week about 8.45pm to make a booking. The person who answered the phone with no introduction, and asked booking details with no friendliness and a fair bit of rudeness, left us so underwhelmed that we called back the next day to cancel. Sure, it was during service, but what were we to do when the restaurant only takes phone bookings? You would think they would at least be adept enough to say the name of the restaurant and their own name and then use a couple of please’s and thank you’s. On the flip side a new and trendy restaurant with an online booking service provided a much better introduction to their restaurant! On the evening of our dinner we were ready well in advance of our booking. We called ahead to the restaurant and the greeting was professional and courteous. The manager welcomed us to arrive early and said we would be seated on the bar and if that was okay to come down early. We love eating on the bar so we came immediately. 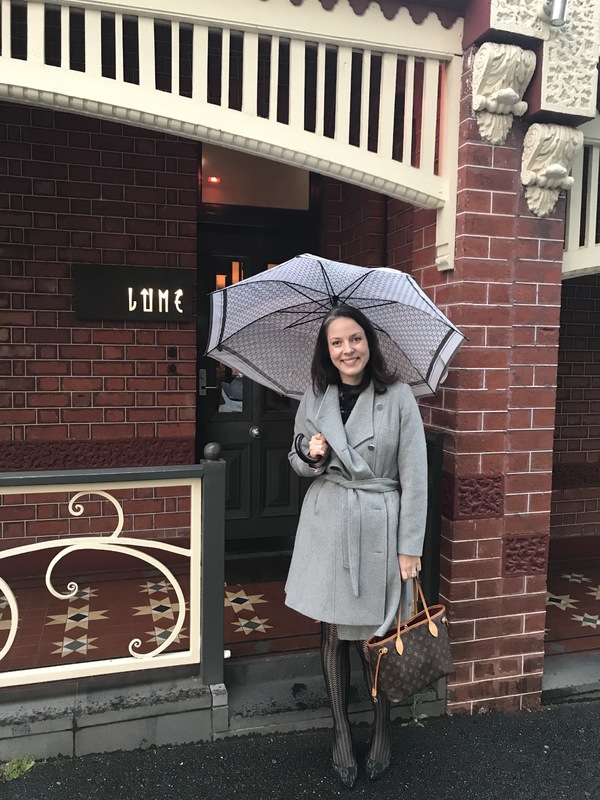 Adding to this initial dialogue, the entrance is warm and inviting, and with an equally warm greeting from the staff, plus some unusually endearing service, we were already feeling thoroughly charmed. 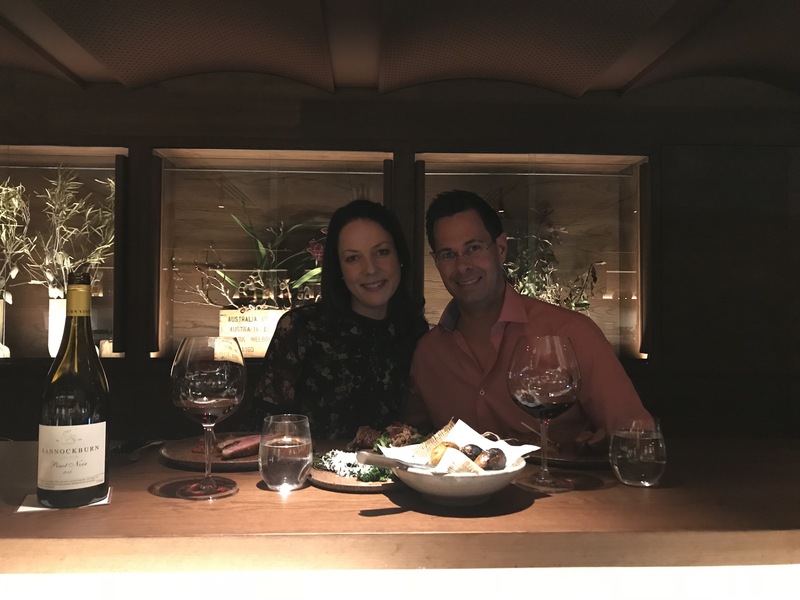 This is the restaurant of Scott Pickett who has in recent times earned acclaim with Estelle by Scott Pickett in Northcote. 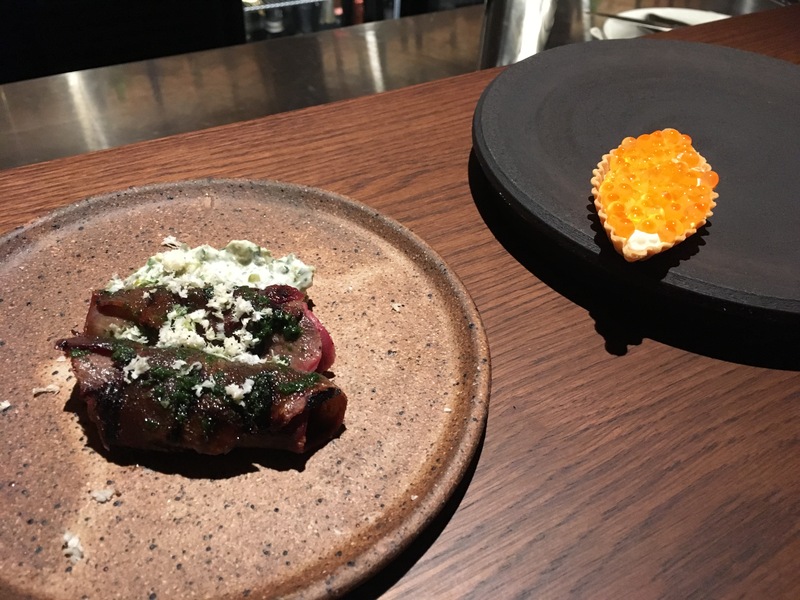 Matilda is the culmination of several years of thought and planning, with a focus on cooking with fire, and native Australian ingredients and produce (without being over the top). The menu is modern with several dishes that can as easily be enjoyed to yourself, as they can be shared. With the promise of dessert always requiring some planning, we decided to have one starter each, share an entrée, and share one of the larger mains (that are for two). Catherine’s starter was a delicate tartlet of salmon roe with bonito cream, that had a taste that met its immaculate presentation. Equally as delicious, but nothing of the subtlety of the tartlet was my charred ox tongue, which was outstanding. 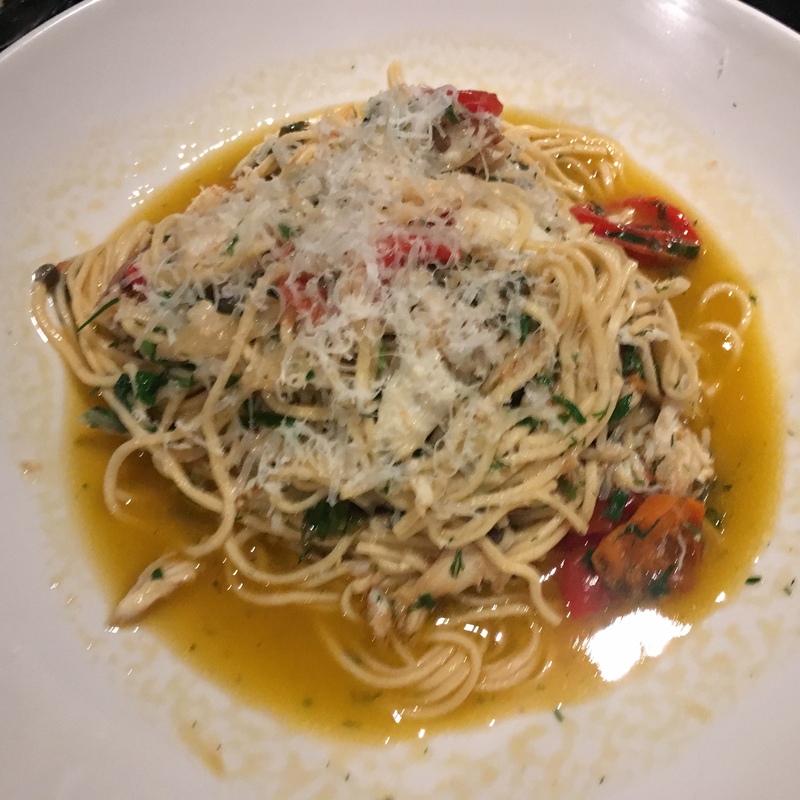 As we were finishing our glasses of Larrent-Perrier champagne, we enjoyed our entrée of spanner crab. 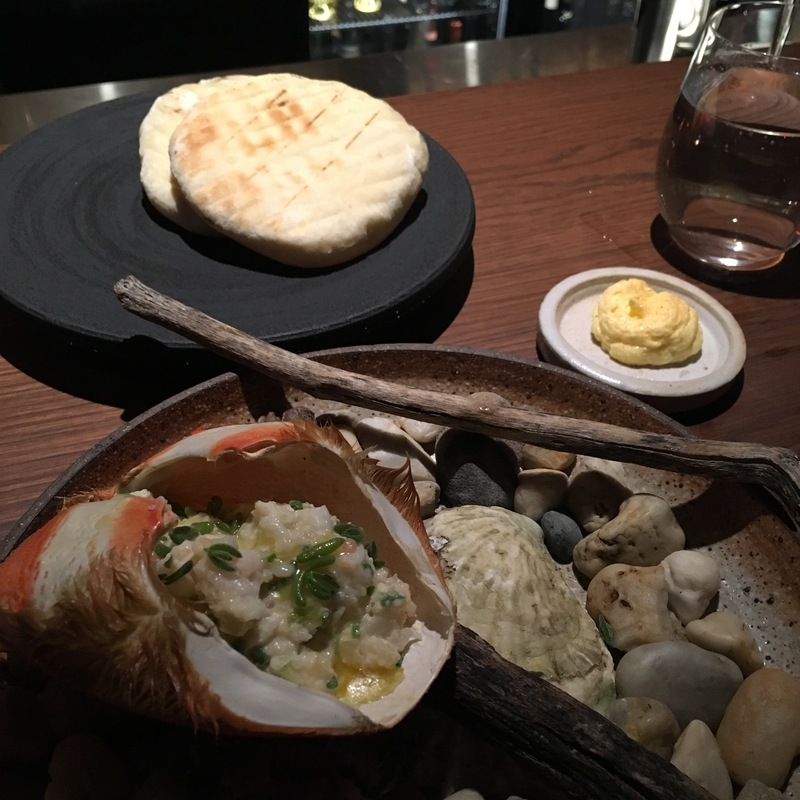 Again, presented with flair, but this time rusticity, the crab was absolutely beautiful, lifted by butter seasoned with dried prawn which is smothered over charred flat bread. 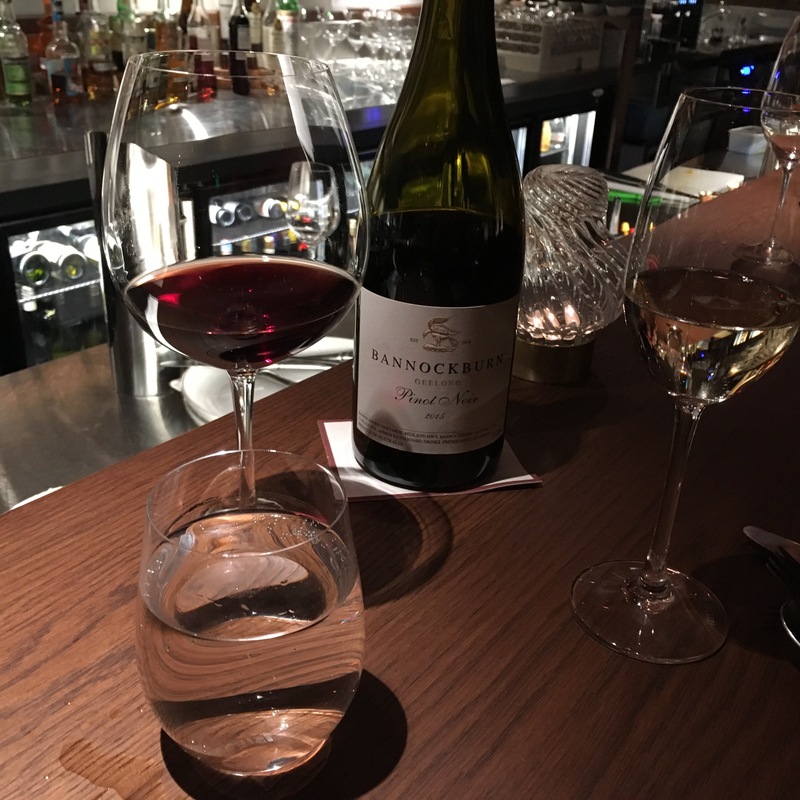 At this point we moved on to a bottle of 2015 Bannockburn Pinot Noir which is a tremendous expression of what Geelong wineries can do with their terroir. Combined with the duck for two, this is a little piece of heaven. The Macedon Ranges duck, presented with two generous strips of breast meat each, a leg, and a “duck taco” on lettuce, plus sides of potatoes and broccolini, is superbly touched by the flames, promoting the gaminess of the meat, but brought into balance with the charred blood orange. 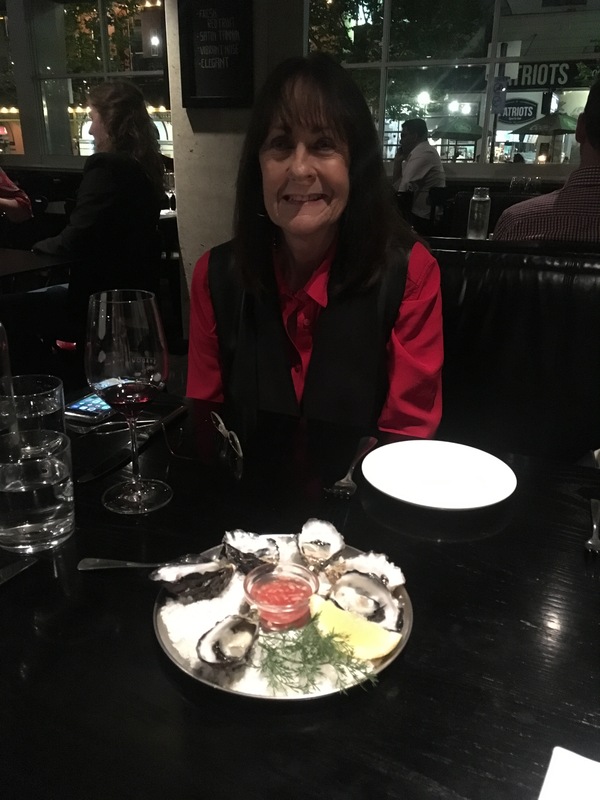 We had been chatting to the staff on the bar, and a number of floorstaff who were all doing a great job at somehow providing a consistent experience even when our main waitperson took a break for a good portion of our meal. We always seemed to be in good hands. 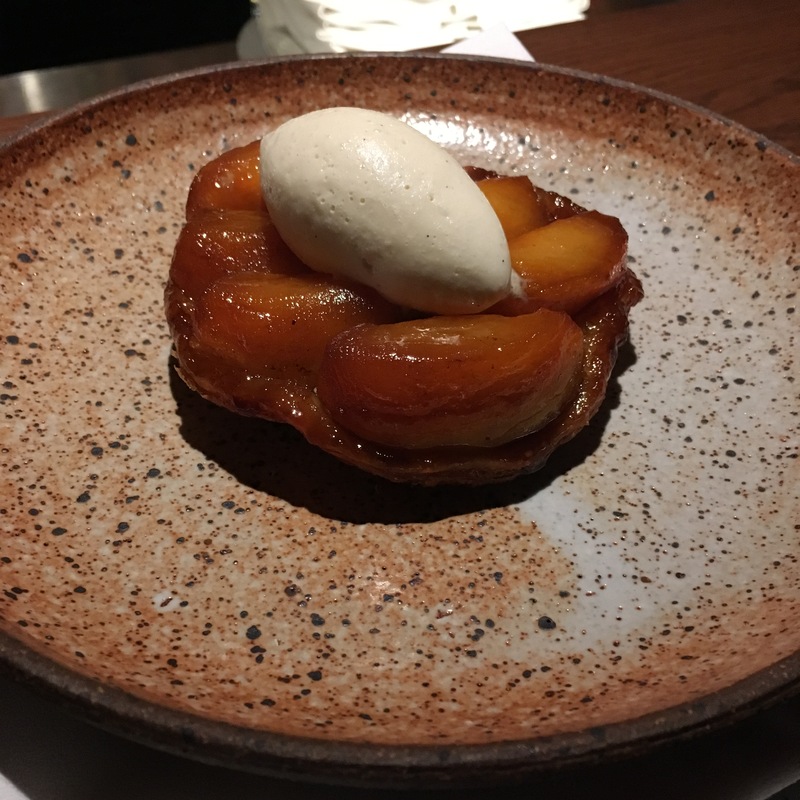 One of the chefs working the larder behind the bar was preparing the Pink Lady apple tarte tatins and we simply couldn’t resist ordering one. The tarte is a great dish to share, especially when we ordered an extra scoop of the smoked vanilla bean ice cream to avoid any arguments! 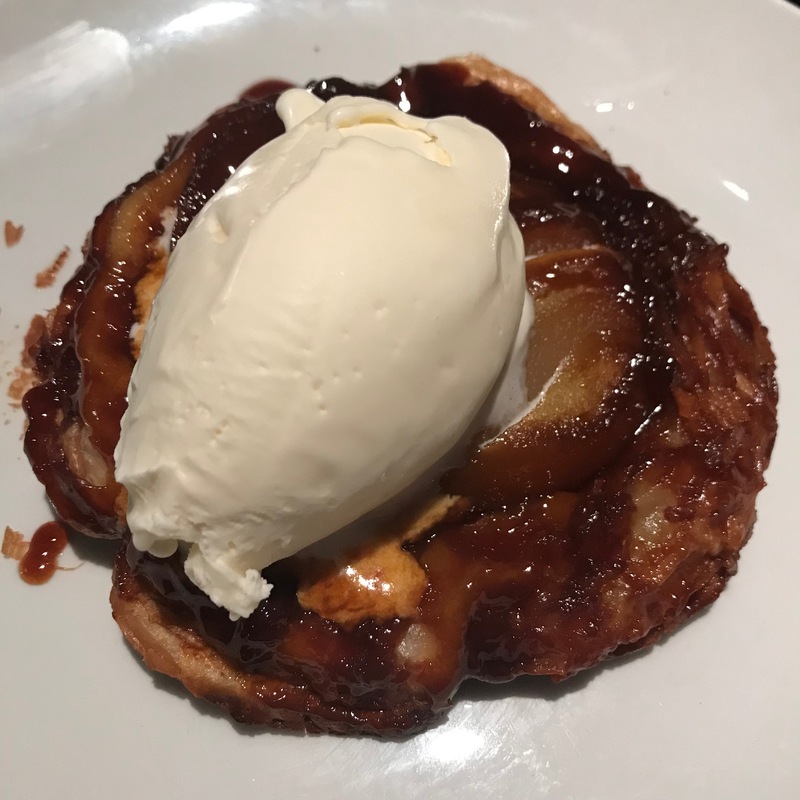 The texture of the apples find balance between being too firm and too soft; the tarte is beautifully cooked with not too much sweetness in the pastry; and the ice cream provides the traditional creaminess that you love with this type of classic dessert. There is so much to love about this restaurant early in its life. The staff are engaged and seem to enjoy being here, motivated by the offerings of the kitchen. The fitout is classy and modern without unnecessary fine dining flourishes. The food is meeting a script that sounds simple, but when put under the microscope shows a high level of thought and knowledge. In this part of Domain Road, across from the Botanical Gardens, good things can last the test of time. Based on this first taste of Matilda I have little doubt we will be visiting a fair bit in coming years, and hopefully decades. This restaurant has the potential to be hot for a long time and the use of fire is only one of the reasons. 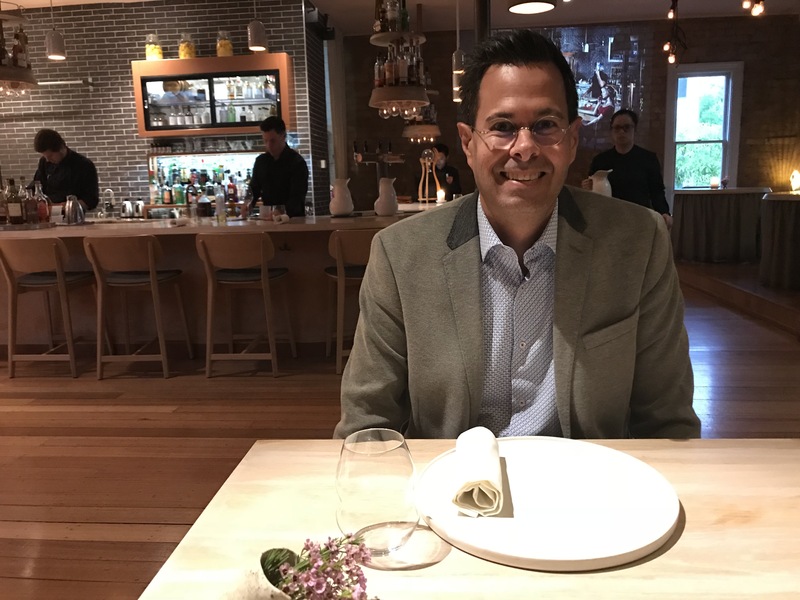 If I walk into a restaurant, and Dan Goodsell is there, I am immediately comforted that the food and wine options are going to be top notch, and the service naturally great too. Over Christmas I did just that with my Mum at Billie H. We were here for a quick wine, but I had heard good reports about the food too. 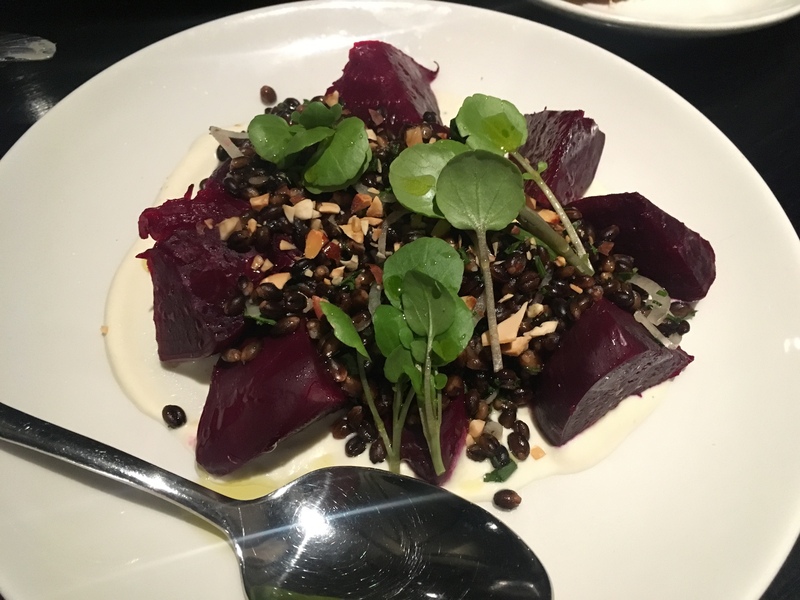 When I saw Dan, and later the enthusiasm of John Lethlean of The Australian, I had it at the top of my Perth list to try. Mum was keen too, the slightly chilled Sagrantino winning her over at first try. This is a little known grape variety from Umbria in Italy that is being made by Jamsheed in Victoria, and it is luscious. The next time I was in Perth I was true to my list. I made a booking at Billie H for my aunty Sher, Mum and I. 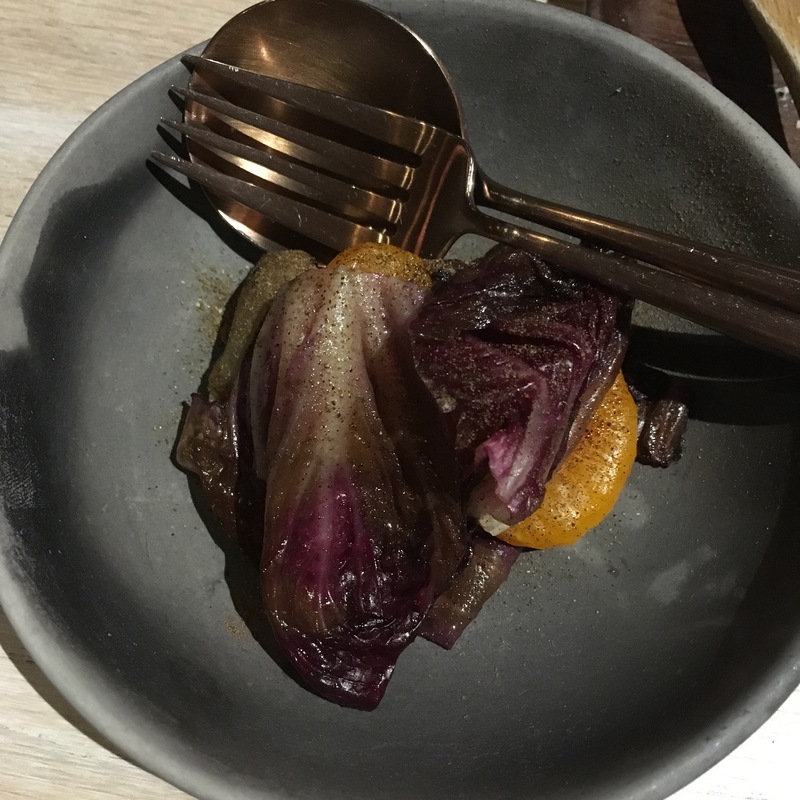 This wine focussed restaurant and bar has the modern Australian share plates theme nailed. It did take us some time to narrow down our choices. 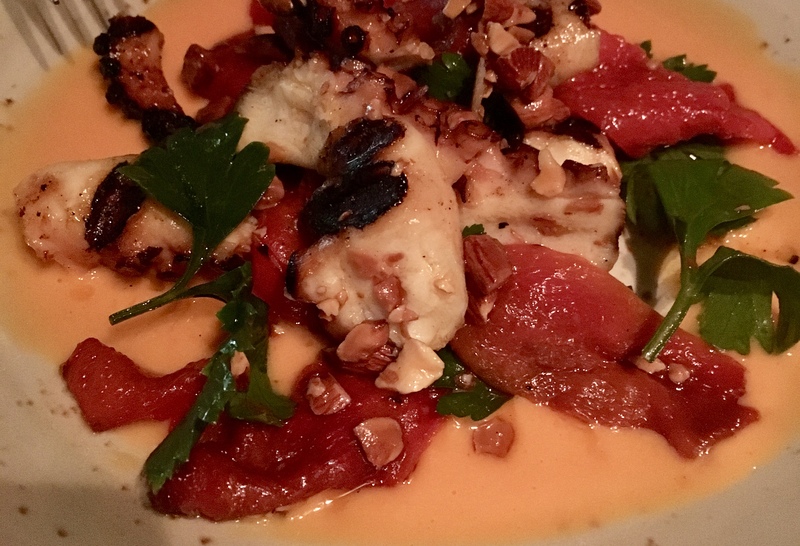 We ended up starting with the braised octopus, which was lifted with the crunch of almonds and the orange segments worked nicely for some citrus. 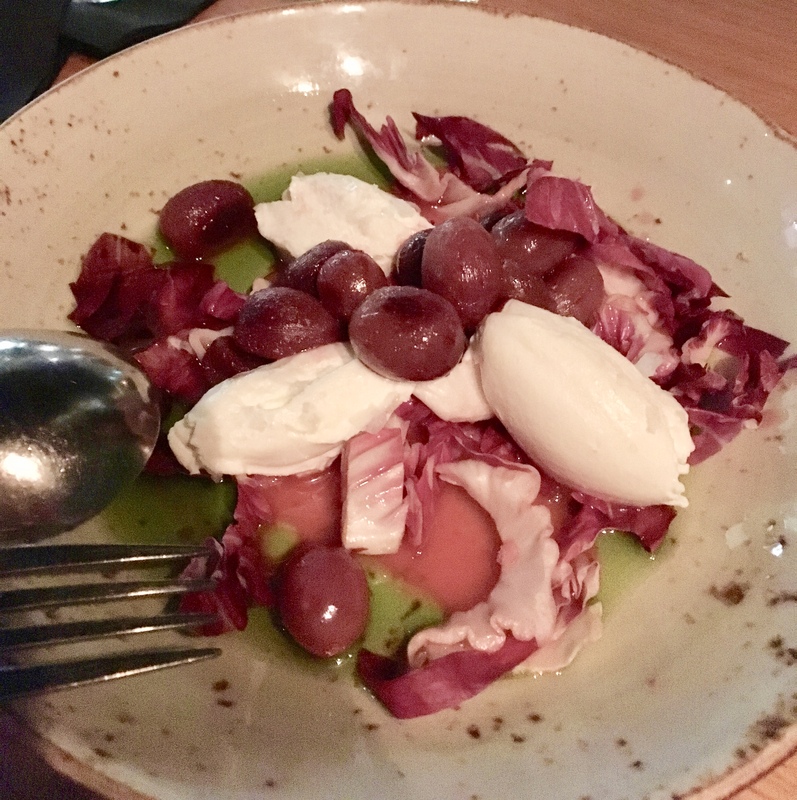 I had heard the roasted grapes with labneh and my favourite bitter leaf, radicchio, is excellent and it didn’t let us down. I love how a dish that would cost the kitchen next to nothing is so flavoursome. This is eating. 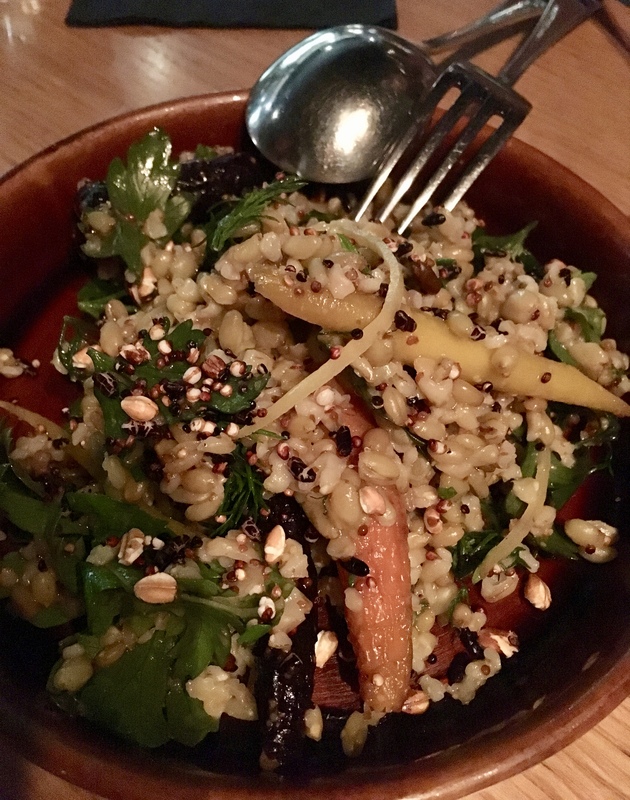 Next was my choice go-to share dish in the carrots, which are combined with farro and puffed grains. 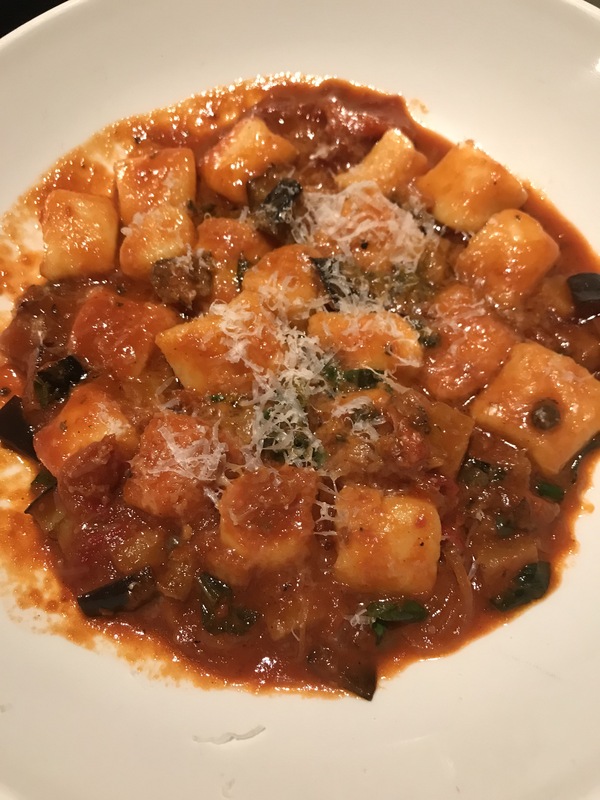 I am finding this style of dish on a lot of menus, including cafes, and it is equally as good whether on its own, or as a side. The natural sweetness of roasted carrots make them so easy to combine with offsetting herbs, adding the texture of grains or nuts makes sense too. 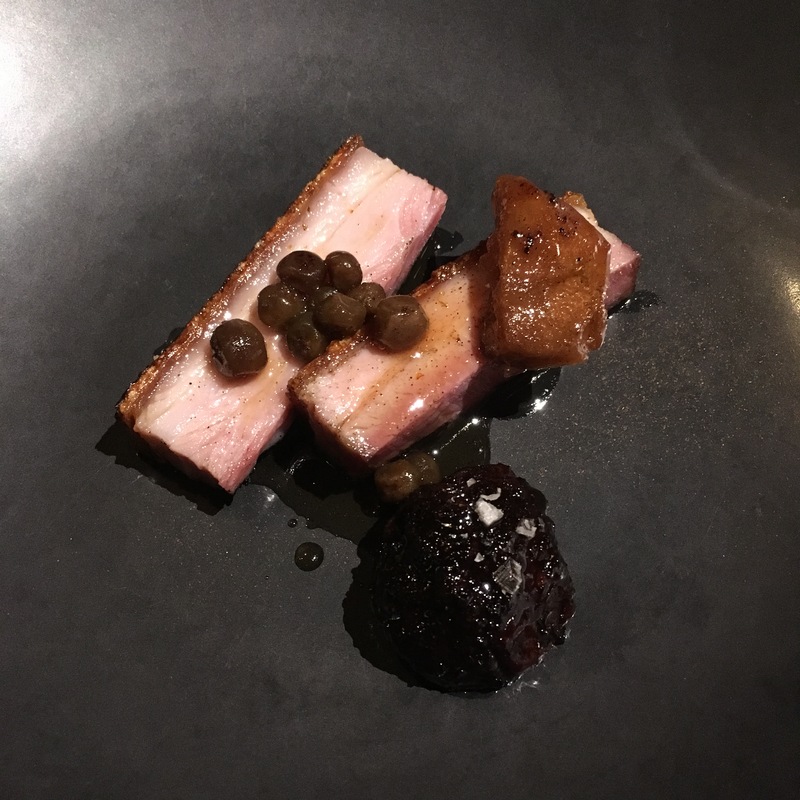 At this stage we were finishing our bottle of Sang De Pigeon Pinot Noir, from the Adelaide Hills, and moving on to the Rayos Uva Rioja, a blend of tempranillo and graciano. The beauty about wine bars that really focus on their list is the diversity you can find. Sure, it is good knowing the old trusties, but having the confidence to explore a list is comforting in its own way. We were in good hands and the wines were both terrific. 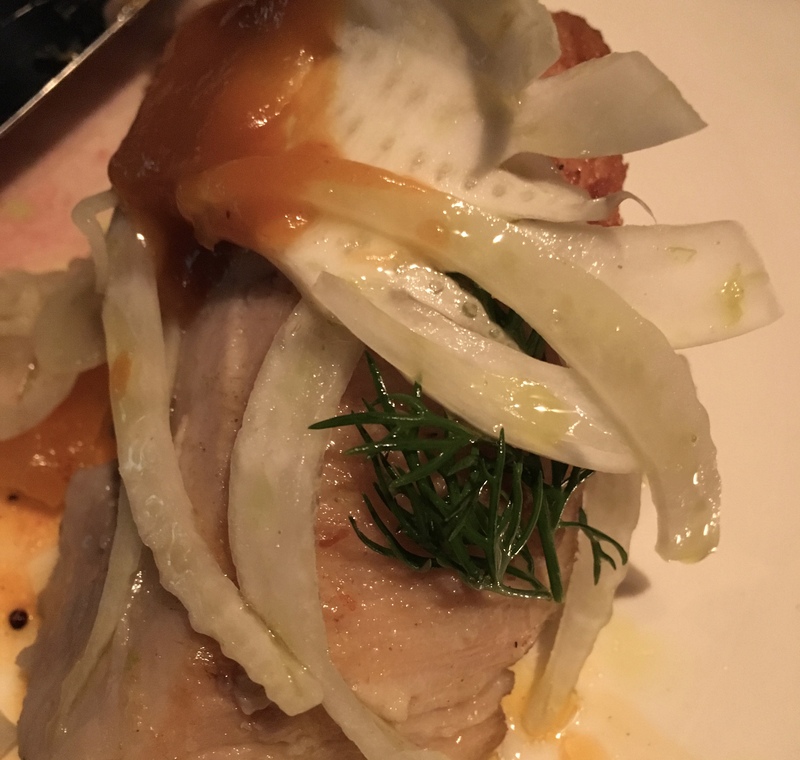 To finish the savouries we tried the pork jowl. Again this is one of those dishes that are win win for the kitchen and customer alike. It is a cheaper, but glorious, cut of meat, and one that you feel much better about indulging when not in your own kitchen. The dishes are a good size and we together are not huge eaters. 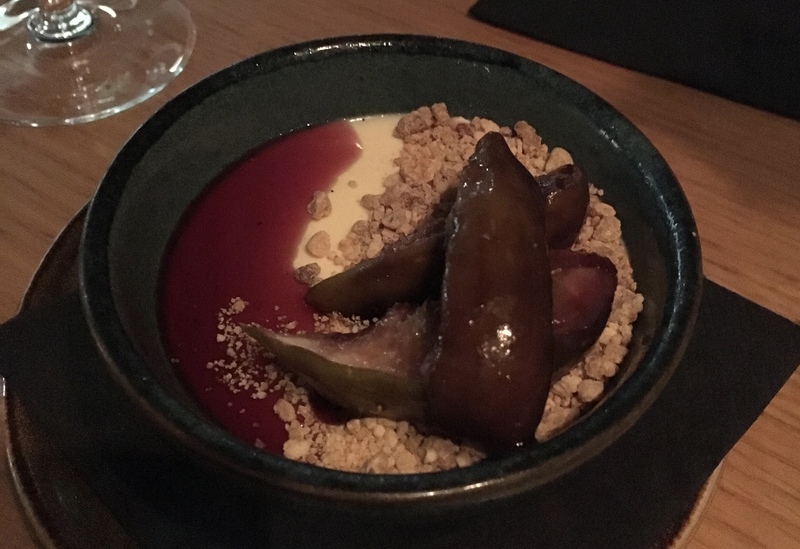 We probably didn’t need it but I insisted on dessert so we shared the panna cotta with red wine figs and this brilliant roasted white chocolate crumb. Everything was well executed, but the crumb was something else. The restaurant business is one of the most fickle. 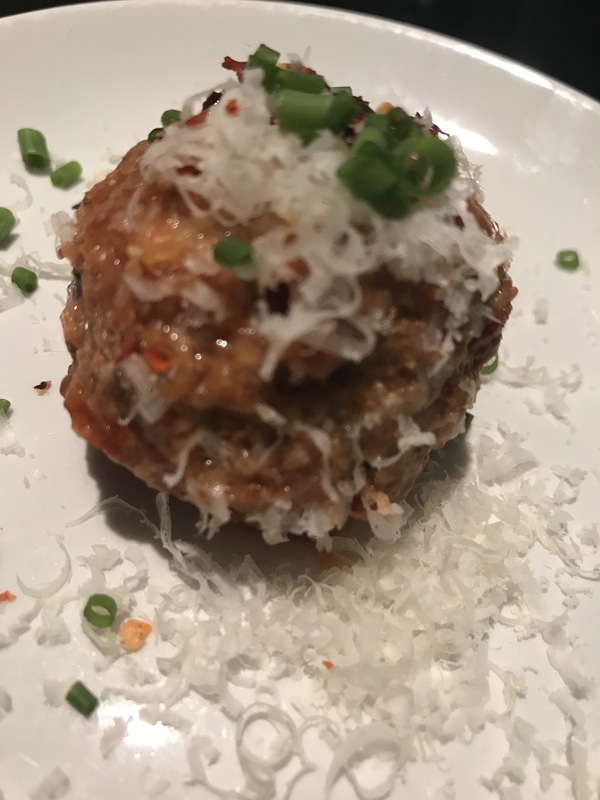 With such a strong history of giving diners what they want, Dan is on to another winner here. Claremont is the richer for it. At times service is a factor only when it is exceptional or terrible. It is not absurd for it just not to be noticed, like children in the 50s. Service should be seen and not heard! There are times where it can blow your mind. Times where you want to return because that compliment you received had to be genuine, or the charm of the maître’d was irresistible. Then there are the stories that you must tell even if it is focussing a touch too much on the negative, like when you witness a terrible car accident. I’ll tell you about the car accident soon but first let’s look at the positives. 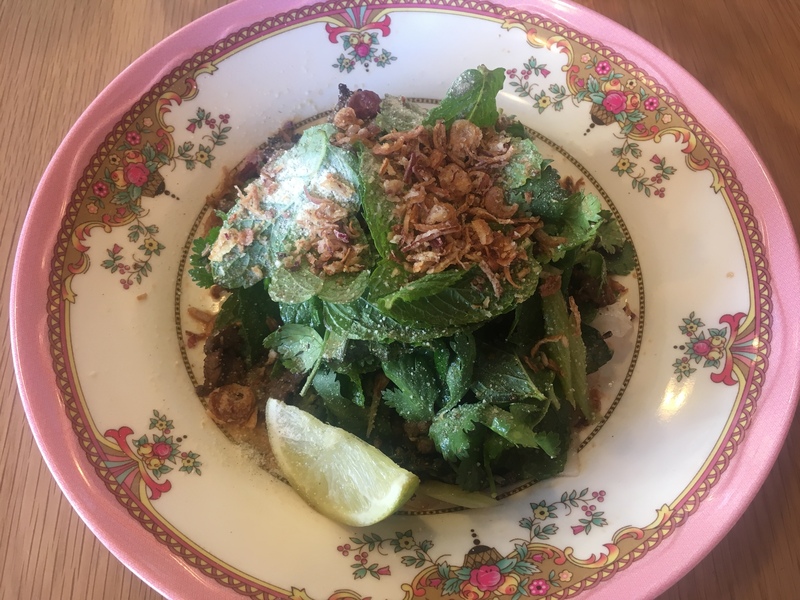 Hanoi Hannah’s New Quarter in Richmond is irresistible like the figurative maitre’d I mentioned just moments ago. It is literally the old and the new for both HH and this building which retains its character, but is completely redeveloped on the corner of Lennox and Swan. The positioning is a real estate agent’s dream. Location, Location, Location! There are staff who have spent an hour getting ready to try to make it look like they didn’t try. The artistic maps sprawled across the wall of Richmond are a delight to behold while slurping your noodles. The windows look out to the restrained Richmond grunge turned fashionable, with more than a splattering of footy colours to add to the atmosphere. I love it. I’ve been multiple times; for lunch and for dinner; quiet weekdays and busy after-footy weekends. 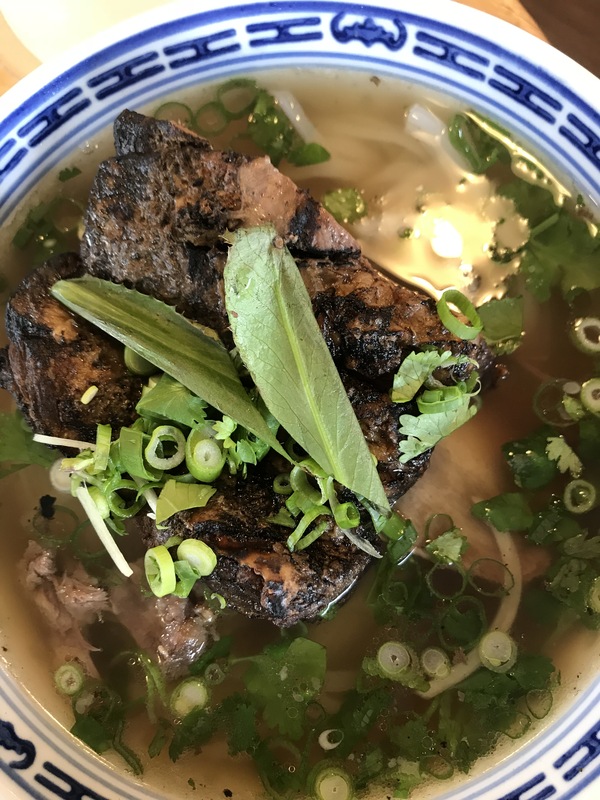 When I first tried the beef shortrib pho I thought it was indulgent, but difficult to navigate. The latter won out and it was taken off the menu but it lives in my memory. 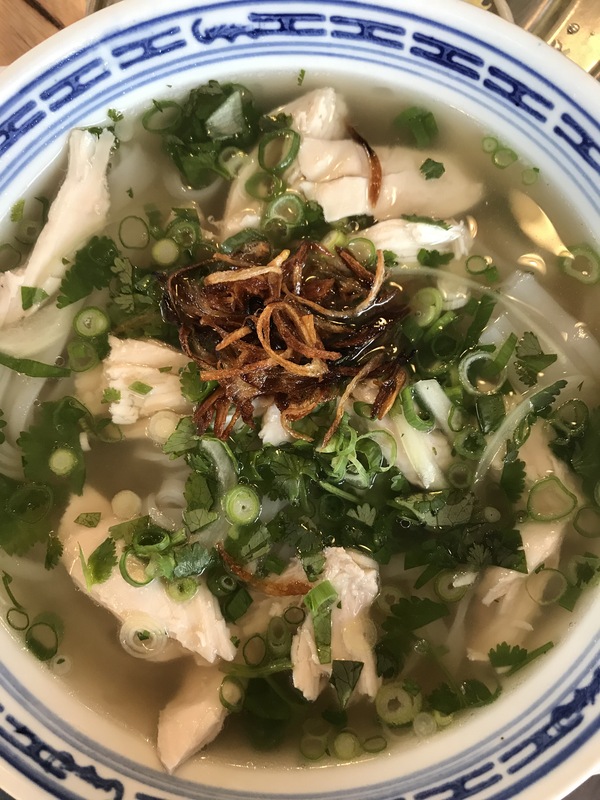 Catherine’s smoked chicken pho was not quite as decadent but definitely made for a repeat offender. The lemongrass beef salad is terrific too. All the learnings from Windsor, which again is a restaurant I’ve frequented, are clearly transported to Richmond. Elements you take for granted are expertly combined. Somehow every time I enjoy a salad with the multitude of herbs, vinegary sauce, and vegetables, that Vietnam and surrounds are famous for, I forget how well you feel after lunch (and how much you enjoy the flavours). Dining with a few friends and sharing is a great idea too. 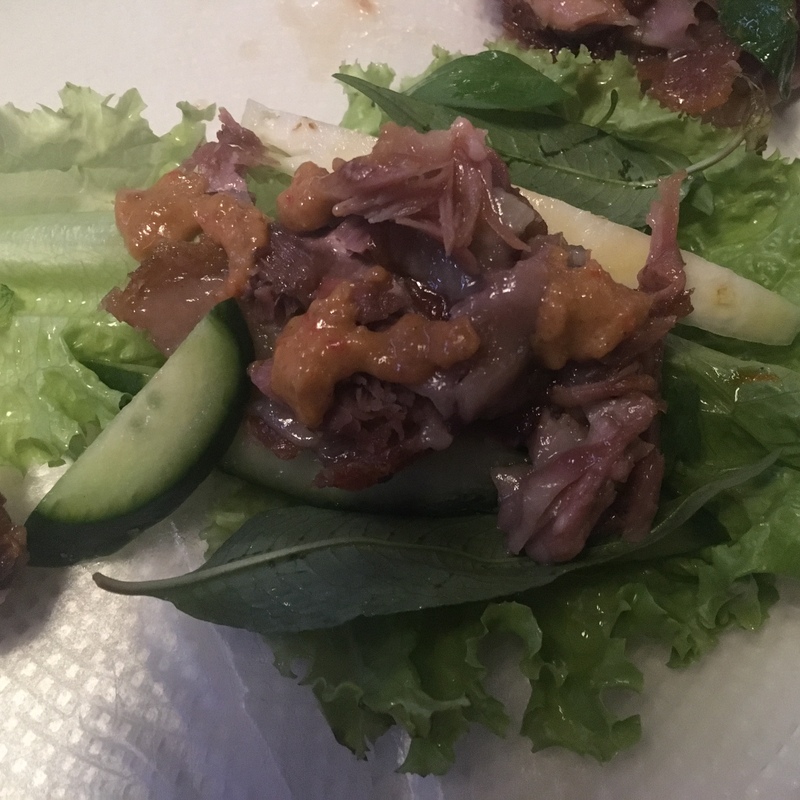 Because on this other occasion I got to try the caramelised pork hock in rice paper. And it was a good moment. 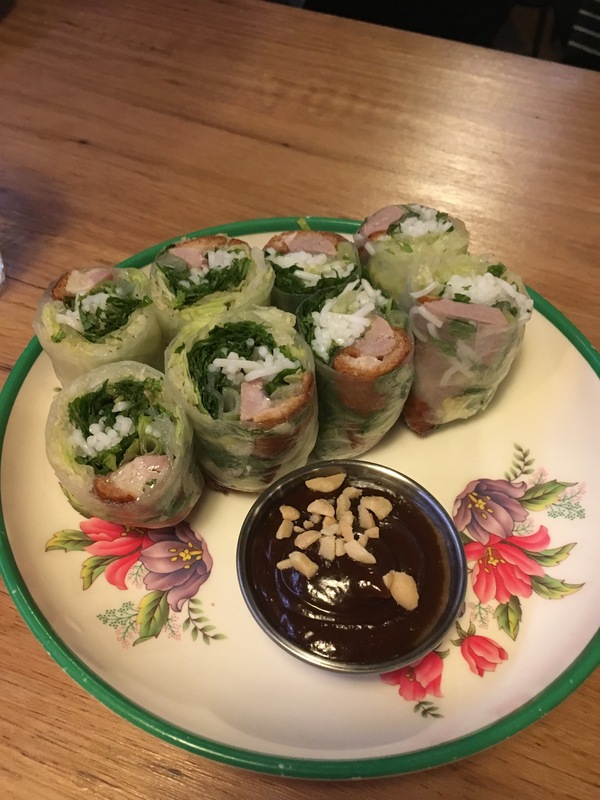 So were the duck rice paper rolls; the chock-full-of-prawns spring rolls; and the spicy lamb curry. 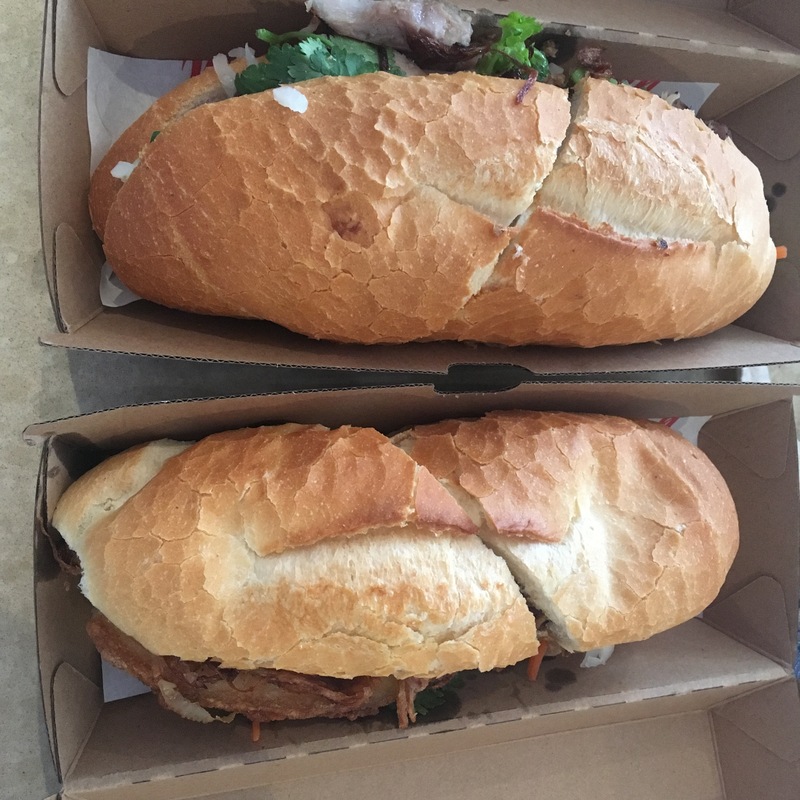 In fact, there hasn’t been a dish that has come out of the kitchen (which includes an offshoot that does takeaway lunch that we’ve also taken advantage of – pork belly bahn mi with crackling for $10!) that has not been good to very good. The service is fine on the whole, but definitely has that touch of “we work in a really popular place so aren’t we great” vibe. So when we were basically asked to order dessert on the spot or leave I took some serious exception to it. It is not a long story. We ordered a second bottle of wine and had finished half of it (ie, we were going to be here for at least 20 minutes longer). We got asked whether we wanted dessert and said “we would take a look”. The menu was provided immediately and the waitperson said “would you like dessert”. I said “we have a half bottle of wine so we can look at dessert and decide while we finish it”. She said “there are two desserts so you can choose now, or I can bring you the bill”. I know the staff are under pressure to turn tables over. It is a busy night. But there are ways you do not treat anyone. 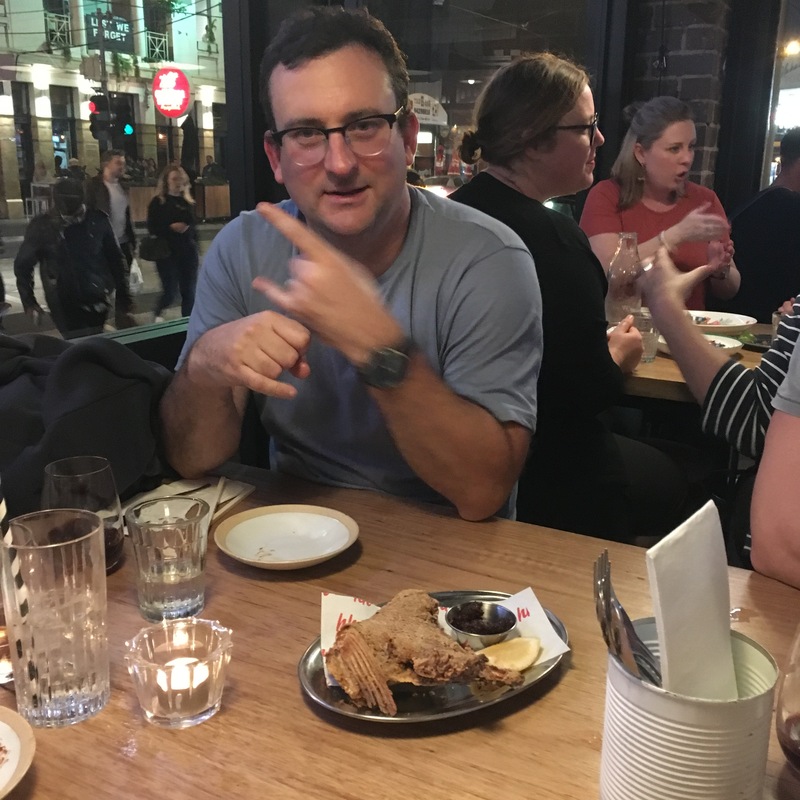 Either my directness at the last comment was noticed, or sense prevailed, and our waitperson apologised reasonably sincerely (and quite profusely) but the damage was done. I said straight up to her that “I have never been asked to leave a restaurant like this before”. There is never any excuse for making someone feel threatened and bullied. We spent $249 over a period of about 90 minutes including 2 bottles of wine. Anyone who reads my reviews knows that we ordered dessert (and the doughnuts were pretty good). 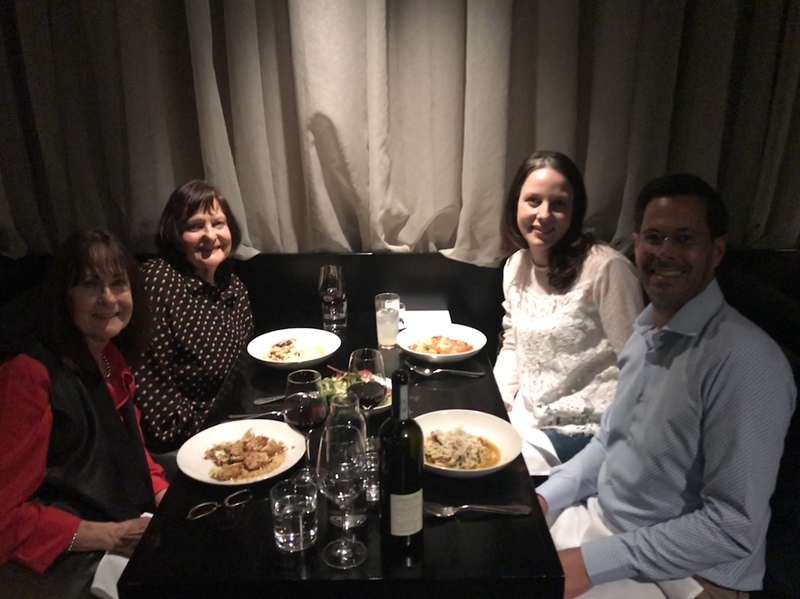 We were not given a sitting time to begin with and we were walk-ins as Catherine expertly got us a table before the footy finished. I really can’t stand the way we were treated at a restaurant I supported 4 times in its first 6 weeks. Not again. Well maybe a bahn mi at the takeaway bit or a cheeky pho! I will admit it. I just don’t know enough about Japanese food to feel entirely comfortable critiquing it. I do know about restaurants and I do know what is good though. There is no aspect of Japanese food that I do not like. Tempura, nigiri sushi, sashimi, yakitori, ramen, you name it; I love them all. When they are done at the highest level of quality it sticks out. There may only be a sparse number of ingredients, making it less obvious to differentiate, but when the component parts are superb, it is something of beauty. Take that tradition of few ingredients and incredible fastidiousness, and add some modern flourishes and you have “modern Japanese”. Like other modern takes on traditional cuisine, it is not a complete transformation, but does make a statement. 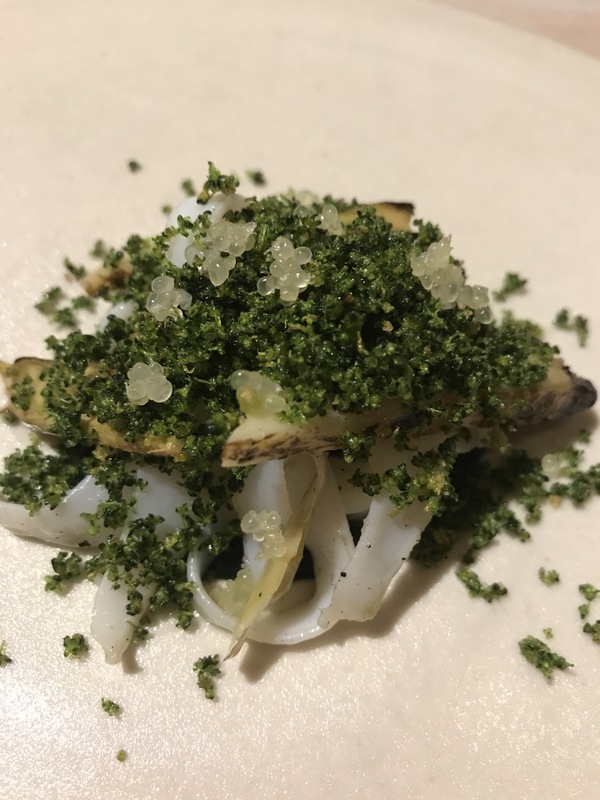 The other ingredients here at Kisume is a rockstar sibling restaurant in Chin Chin that is still attracting lines of people many years on, a glamourous space over a couple of levels, and that intangible cool that is a magic of its own. 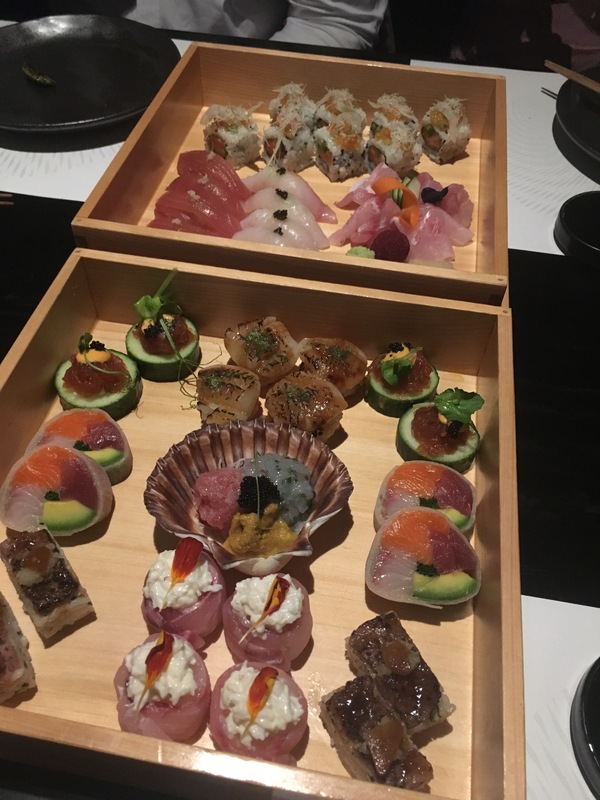 We had the tasting menu with the deluxe sushi upgrade. The food is by no means flawless, or even close. The service is chaotic at times, but generally okay. No one seems to care that much because this is one of the hottest tickets in town. The experience feels similar to when you see your favourite band – even if they are not the best they could be, you are so excited you don’t care that much. 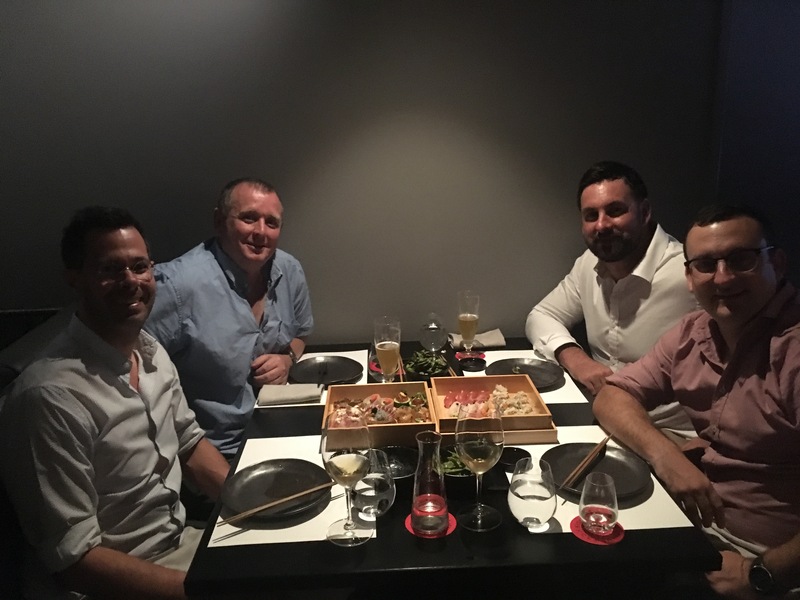 Tonight I’m dining with three friends and we all have different views on Japanese cuisine. “Chef” as we know him, is not a devotee and, unsurprisingly, this is not his best experience. 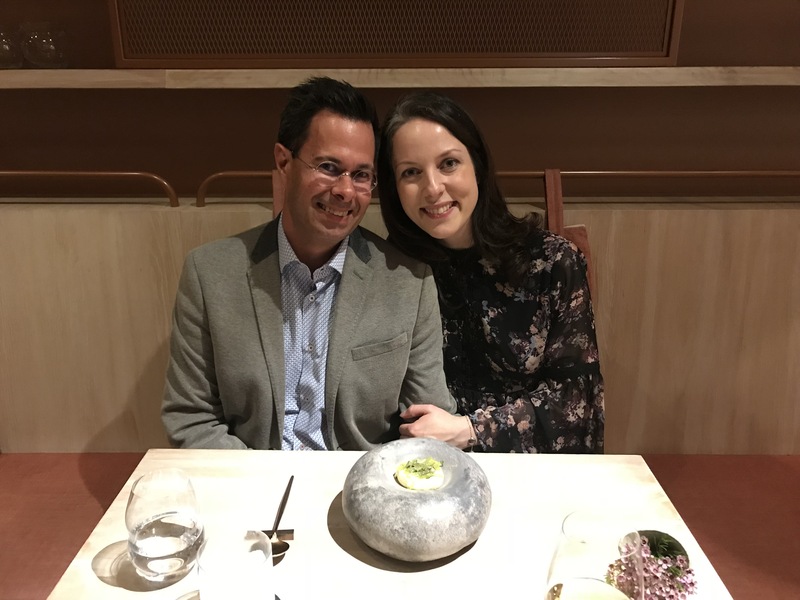 Jarrod loves Japan and Japanese food, but was unmoved by several dishes. Trav has been to Japan multiple times too but had a more positive response. The tasting menu started with edamame. 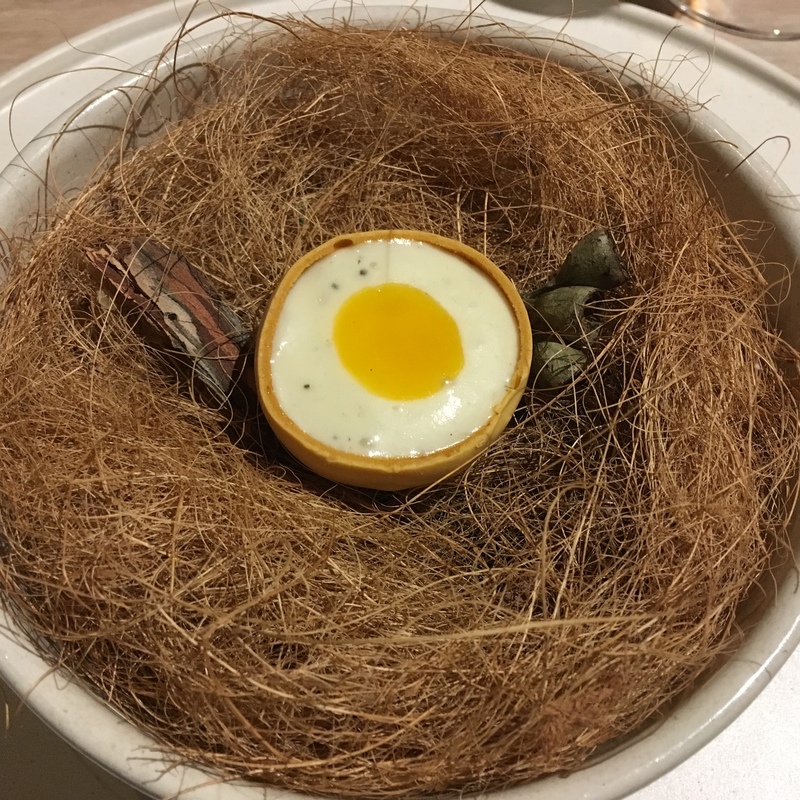 We had already been suggested to try some as we decided what we would order, and whether we would try the tasting menu. They were very nice, chargrilled with salt and garlic oil. After opting for the tasting menu we were told that was the first course anyway. Then we received a further two bowls. Three bowls of edamame for four people? We felt bad leaving one completely untouched but the staff didn’t admit it was a mistake, and either way that is a lot of edamame to eat. Next were some delicious pork gyoza that some at the table were saying are equaled at several other venues in Chinatown, but I thought were terrific. Kingfish sashimi that is first class comes next. 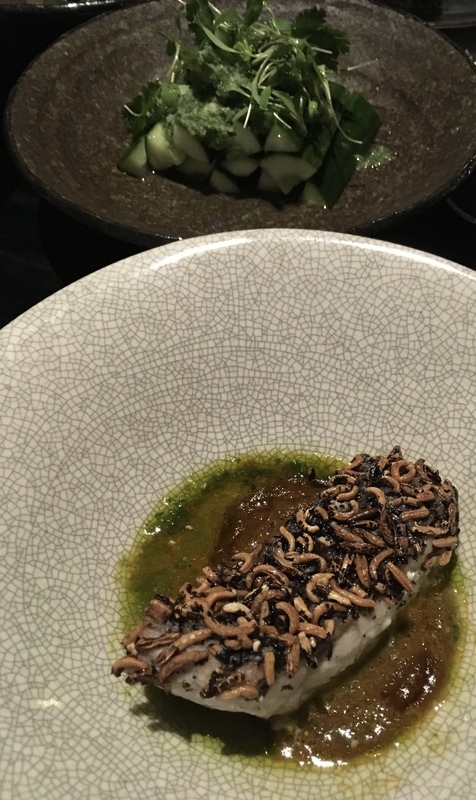 Truffle soy and black truffle elevate the flavours, but the kingfish is top of the range. 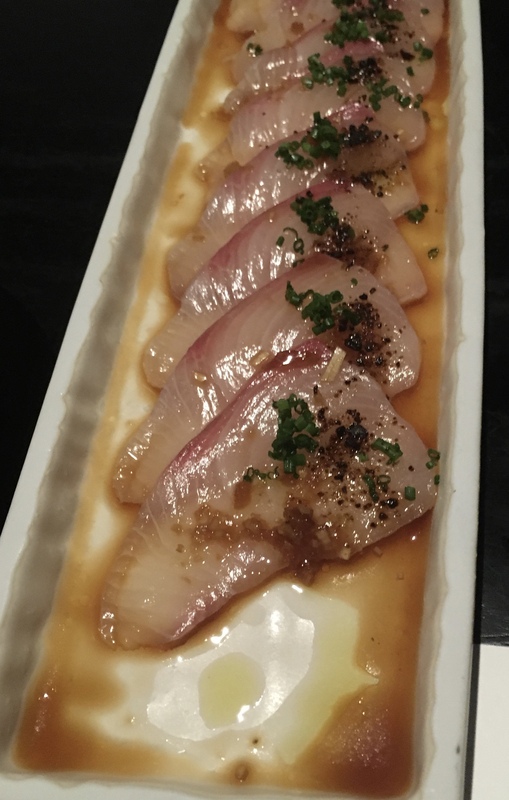 When kingfish is this good it reminds you why variations are so popular on restaurant menus. It was my favourite dish of the evening. The sushi boxes have some serious diversity. There is sashimi, nigiri sushi, and several other tastes and textures including the uramaki (inside-out roll). The issue here is the varying degrees of enjoyment from the food. At the bottom end some of the sashimi is chewy in an unpleasant way, and the combination of uni, pastes and roe in the middle is difficult to understand (and not explained by our waitperson). The large pieces of cucumber are a distraction. On the plus side, the nigiri is excellent (wish there was a lot more) and some of the sashimi was beautiful too. 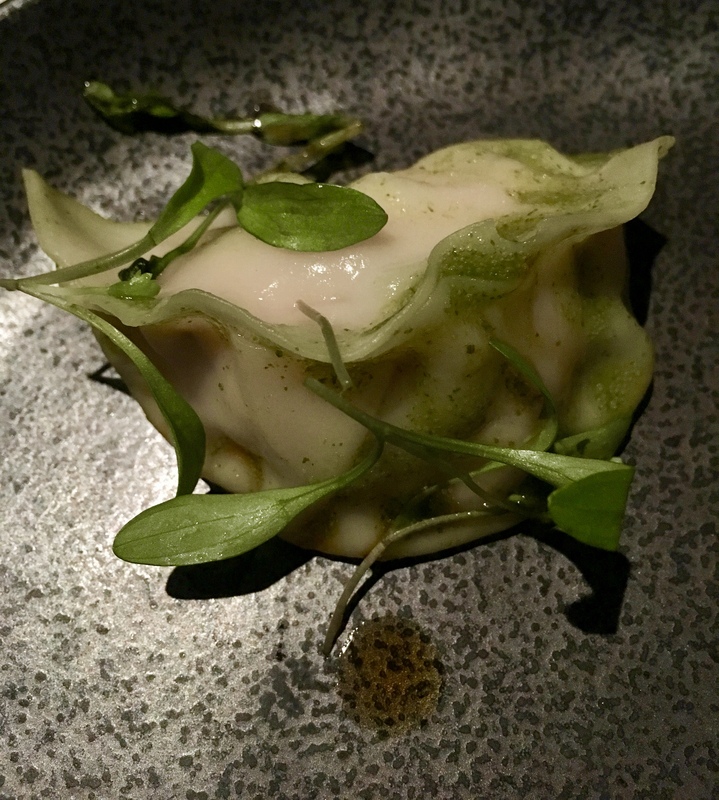 I appreciate the skill involved in the chrysanthemum tofu, and I like the silken texture, but the miso is plain. Anything but plain, the grass fed beef tenderloin from O’Connor’s is almost completely covered in foie gras. As an ingredient, foie gras is the epitome of richness, but there is an issue with the beef. Experience of beef in Japanese restaurants has always involved an awe about how it can be so tender and juicy. 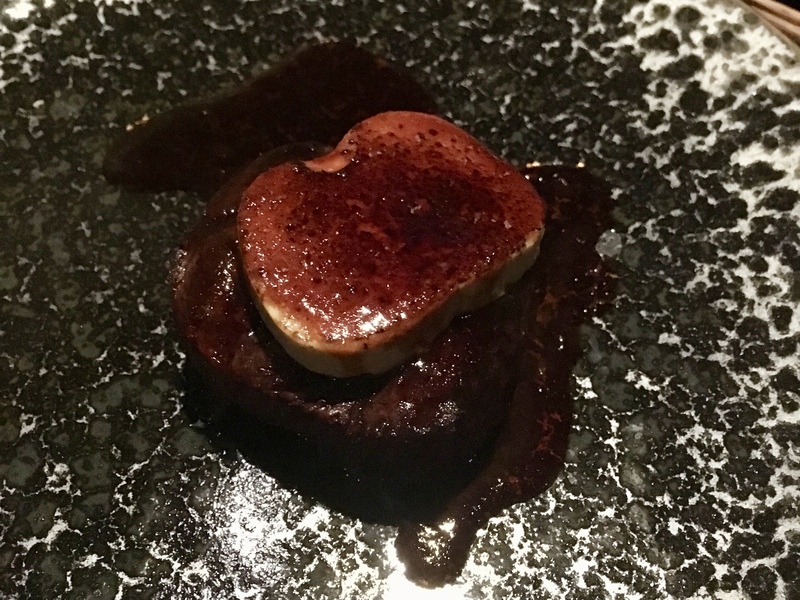 The richness of the foie gras simply doesn’t mask the fact that the beef is not up to the quality we would expect. The hapuka fish with a puffed black rice crust is easily the superior of the two mains. The crust works really well against the firm and juicy fillet. Add the spicy miso and chive oil and you have a very nice dish. The side salad of cucumber, cucumber and more cucumber was pleasant enough with its vinaigrette dressing and good measure of coriander. However, did we really need three of them for four people. Generousity is one thing, but wasting so much cucumber felt wrong, especially after our three serves of edamame. The dessert to finish lacked impact. Three puffs of cream with some additions for texture. It was sweet, and we ate it (in under 2 minutes), but it felt like an afterthought. 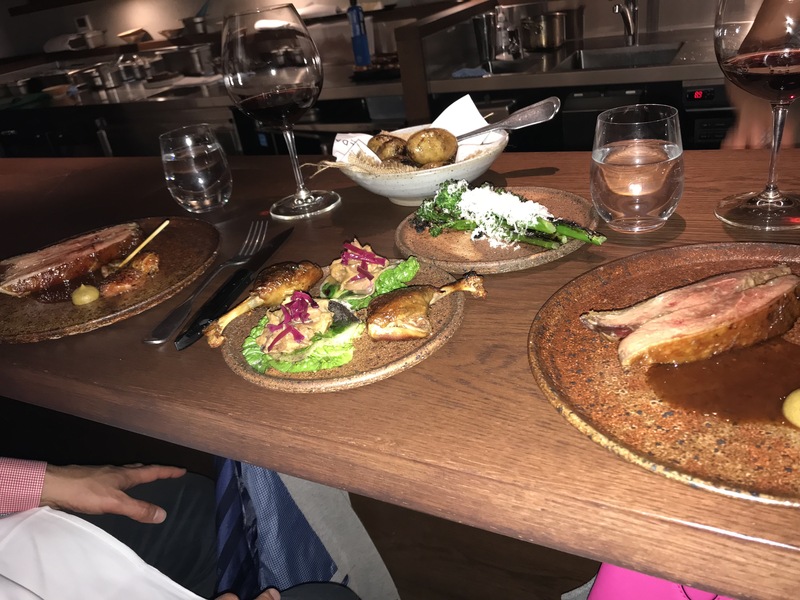 On this one experience I wouldn’t go back to Kisume, but I’ve heard enough good things about the Chef’s Table (exclusive to 12 people) and there were some serious highlights. There’s little doubt that with a restaurant this spoken about it will get another chance, but I hope it is better the second time around. Most people have a Flower Drum story, and a view on its merits as a big night out. Back when I first ventured there in my mid-twenties it was a three star restaurant still at the height of reverence from most dining circles. It was described to me at the time as a destination restaurant even for people living in China. 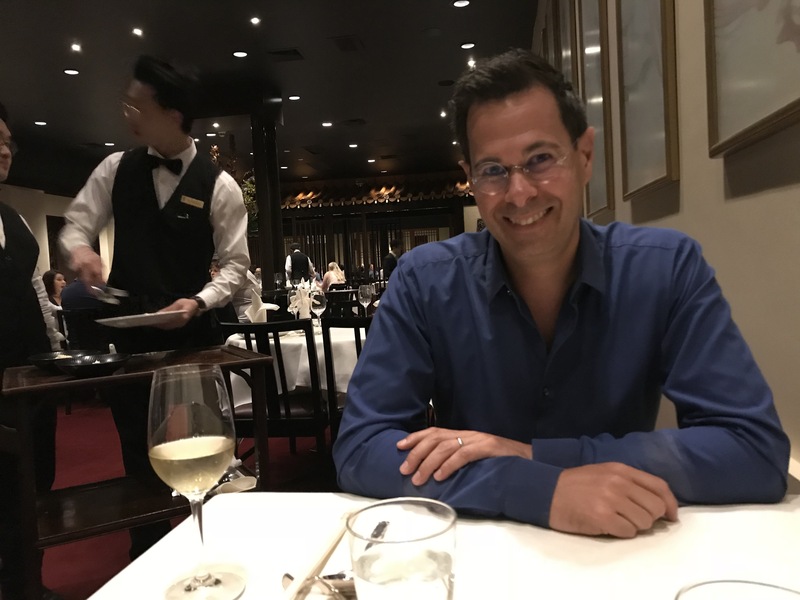 Naturally, I took that statement with a degree of skepticism, but when your waitperson has been at the same restaurant for 25 years, there is an instant knowing that something is going particularly well, in a world where a year is a milestone in hospitality. Fast forward almost one and a half decades and the knowing is of a different kind. 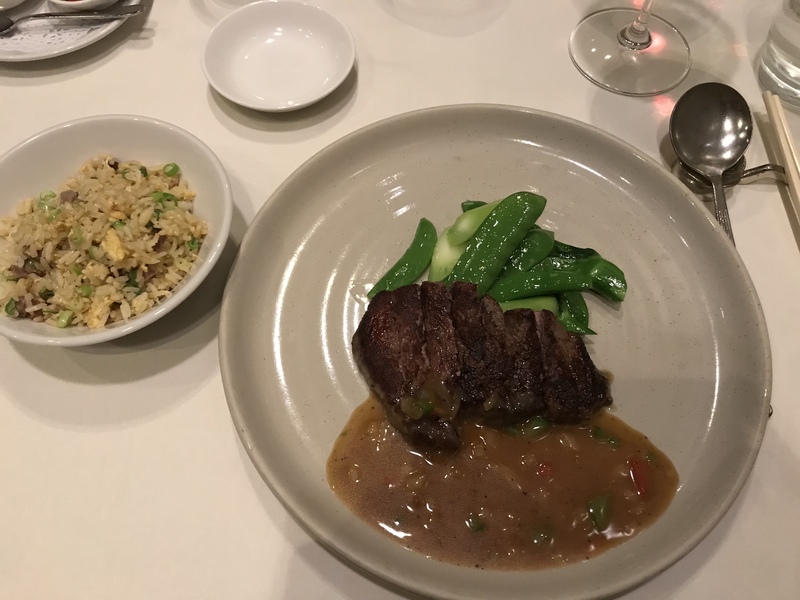 These days I know that you should expect flawless service, and that the tasting menu will include Peking Duck and beautifully cooked beef. In the lead up, the reception when I mentioned Flower Drum was anywhere between excitement and a feeling the place is now passé. It’s almost as if, in this dynamic world of constant change, that doing something well, over and over again, might be overrated. 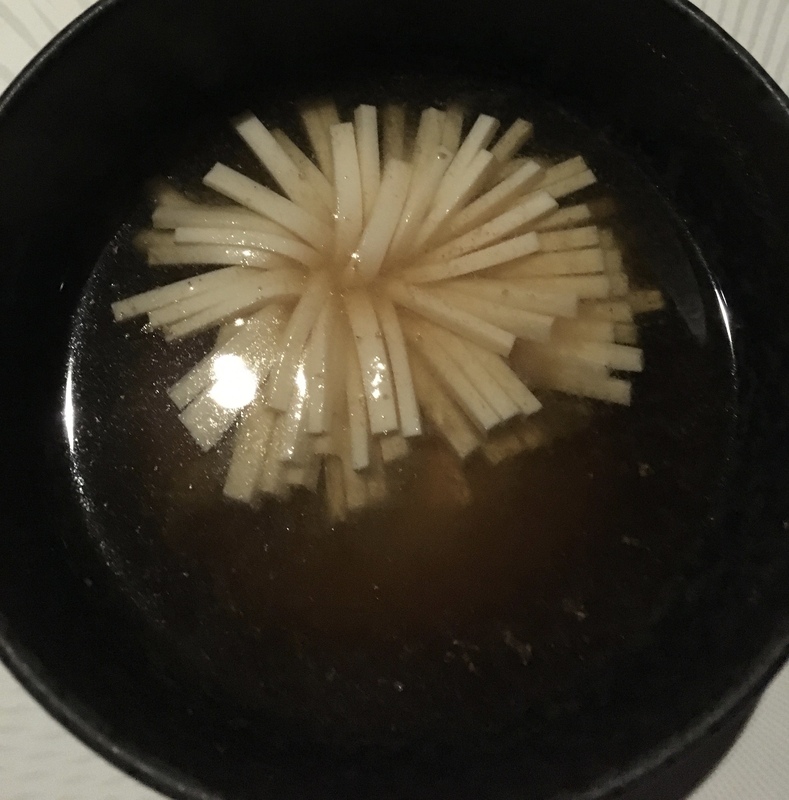 In a sense I can be guilty of this too, but an understanding of why focus and precision is beautiful in cooking terms was strengthened from my trip to Tokyo last year, and a few other instances here and there (often in relation to Asian food). 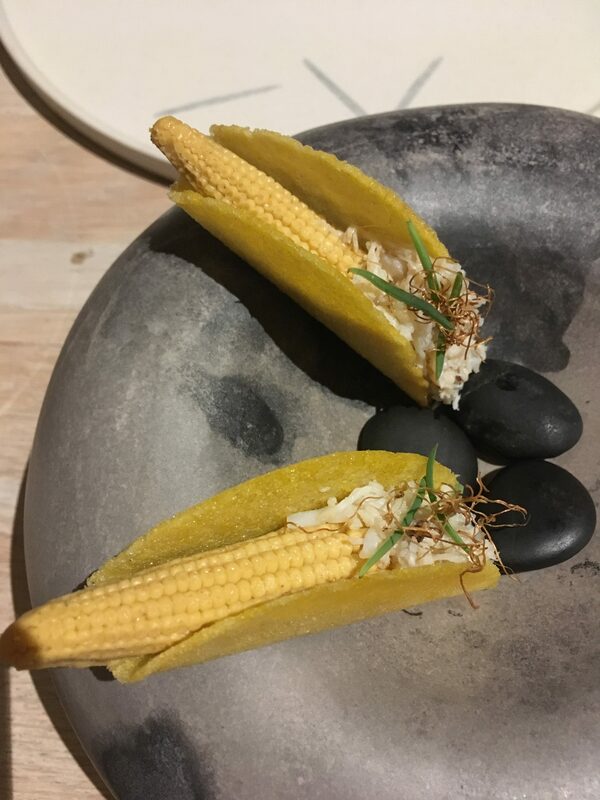 To my surprise, there was one change to the “four course” tasting menu tonight, which was no san choi bao, replaced by a crayfish omelette. This was the first course and a delicious introduction into the meal to come. 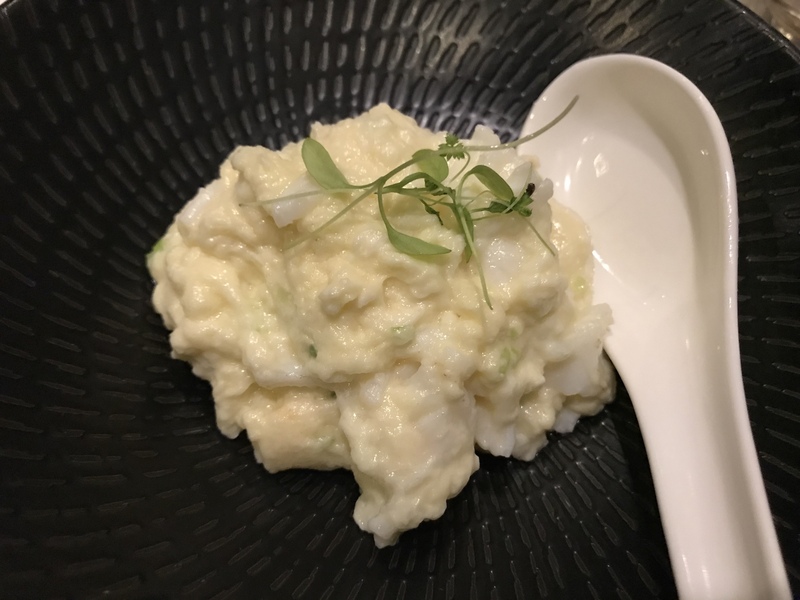 The dish is perfectly seasoned (salt and pepper is provided, but not needed), with large chunks of juicy crayfish smothered by a fluffed egg white omelette. 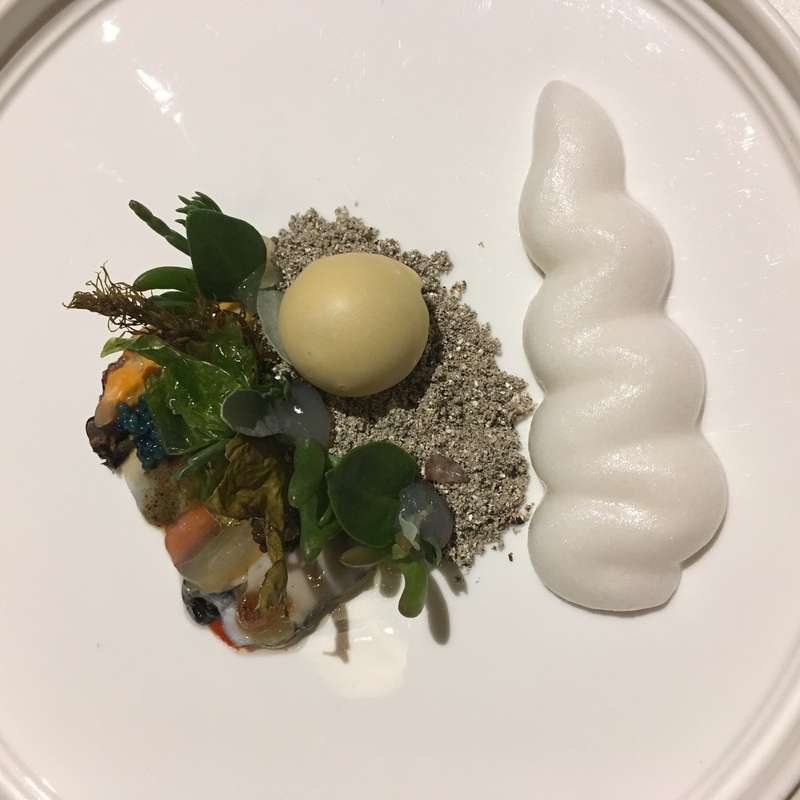 For a long and generous tasting menu, the richness of this first course is felt later in the meal, but I wouldn’t be offering a spoonful of that crayfish back. Skipping over the service at Flower Drum would be like going to the Taj Mahal, taking a photo, and walking back out. It is intrinsic to the atmosphere in the room, almost prompting a sense of Zen. Like many things of beauty, it is hard to put your finger on exactly why the service here is spoken about like it won an Olympic gold medal. 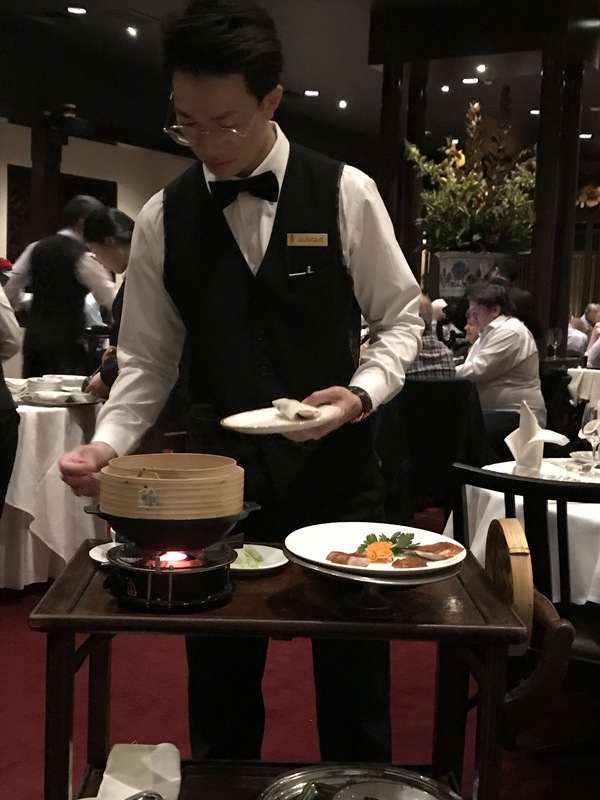 While tonight there is little chance our waitperson, Vincent, has been working at Flower Drum for 25 years like one of my first experiences, he is thoroughly trained. The dedication and commitment to excellence here is astounding, but it doesn’t lead to a loss of personality. A good example is towards the end of the evening when we complimented Vincent on how well he handled our AGT Vouchers (I get a discount through work which is great, but the paper voucher has caused some issues!) Rather than accept the compliment with the same humility he had shown throughout the evening, he humorously said “thank my Manager” with a grin that he would have had no idea what to do. 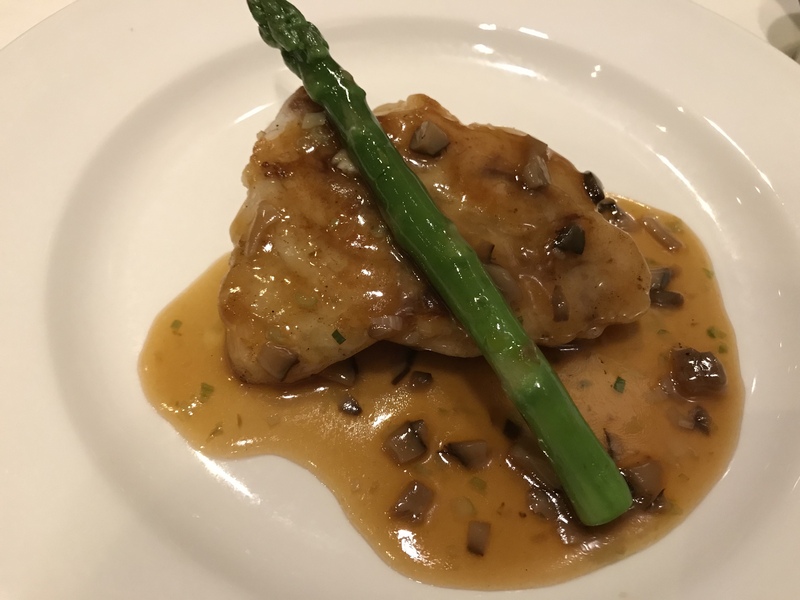 The next course we enjoyed was the barramundi, with a glutinous shiitake mushroom sauce, and asparagus. 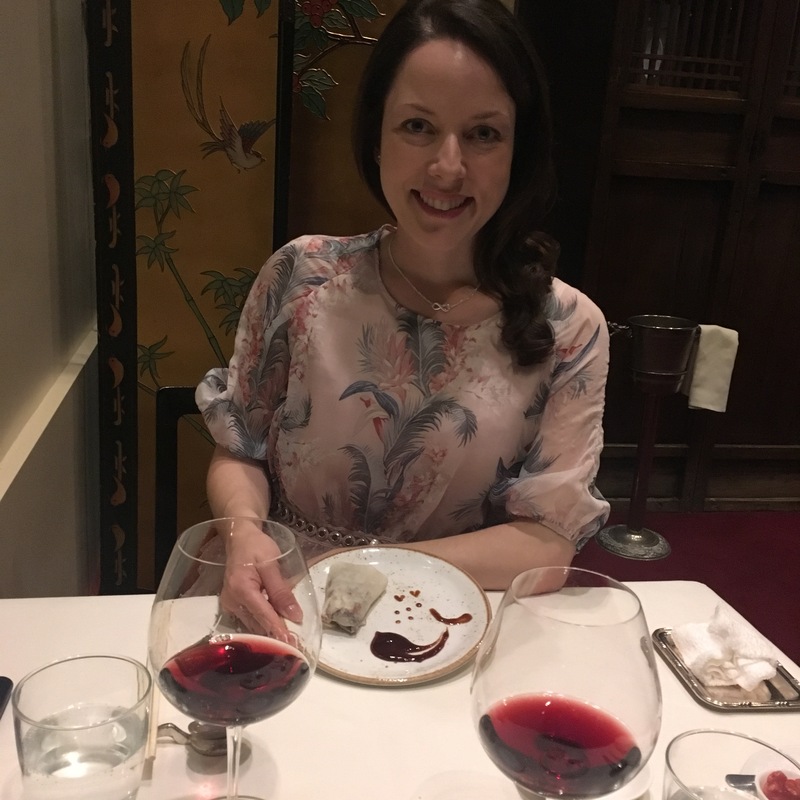 I could see Catherine looking at the whole fillet of fish, and back at her chopsticks, and I was instantly brought back to the first time I ate fish here. “Don’t worry, it falls apart easily” I assured her, and sure enough, the fish parts in bite sized pieces perfectly held together for less sophisticated chopstick enthusiasts like myself. Besides the perfect fillet of lightly battered barra, the sauce shares the limelight with a huge lift that doesn’t mask the fish, but does add some punch. At this stage we were finishing our Moorooduc Estate Chardonnay, displaying a good level of oak and some old school malolactic fermentation that we quite like. Next we switched to a half bottle of the Paringa Estate Pinot Noir from 2013. The Pinot is glorious, especially with the upcoming dish. 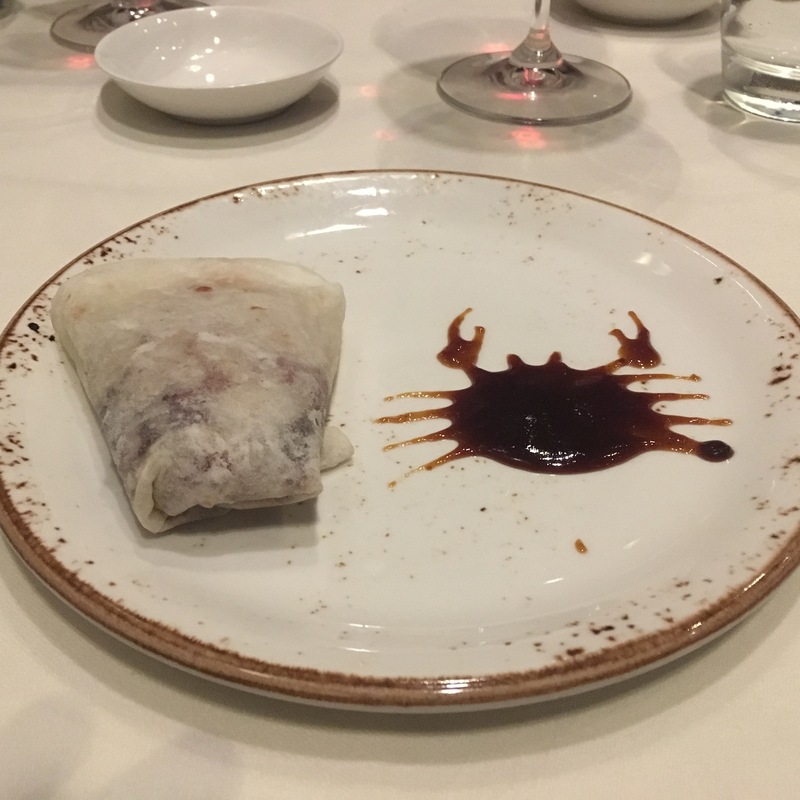 That dish is the famous Peking duck which these days is presented with some hoisin art. It’s a bit gimmicky, but delightful at the same time. Once you taste the Peking duck your mind shifts to how succulent the duck is, and how perfect the pancake packaging is. One day I would like to be able to be a regular here just to have the Peking duck. For now my two tastes, matched with the Pinot, are just gorgeous, leaving me to hunger for the next time I’m here, which will be sooner than 13 years. Next comes the beef, and I really don’t remember it being this large? You are basically presented with a small steak, Asian greens, and a side of unforgettable fried rice. I like this fried rice better than both Lung King Heen and RyuGin, both owning three Michelin stars in Asia. There is a choice to upgrade the beef from local Black Angus to Wagyu which at $40 per head we didn’t do this time, and we were not regretting our choice because it is hard to imagine how the beef could be that much better. Using chopsticks, each piece melts in your mouth, the technique better than most steakhouses, and practiced for a considerable period of time with this 43 year old restaurant. For dessert we are given a choice, which is never a great idea because the negotiation is intense. 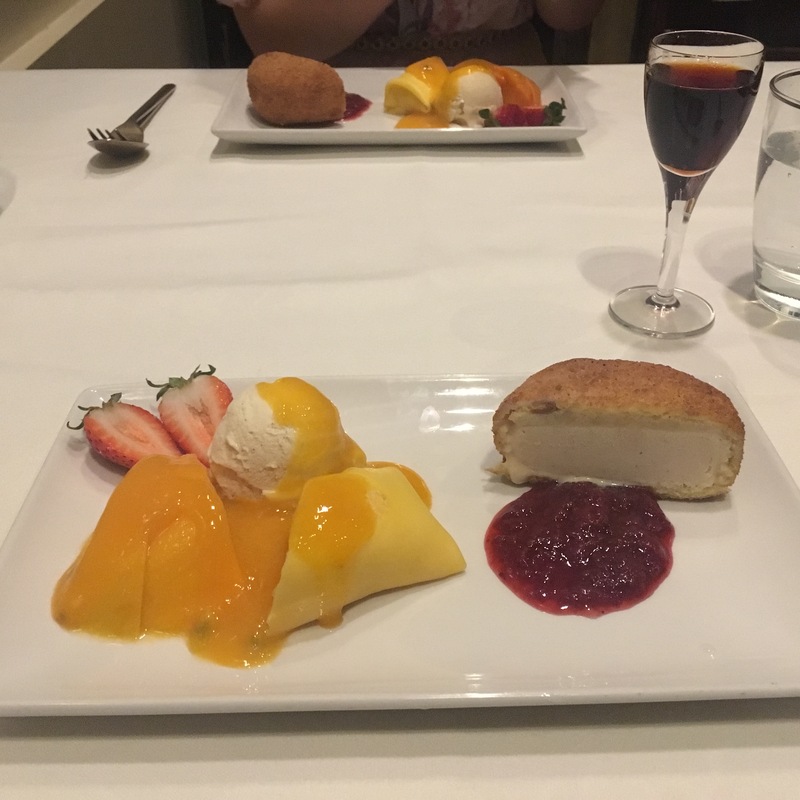 From the beginning I wanted to have the mango crepes and something a bit more on the edge. Serious contemplation followed as we tried to let our savoury courses digest. 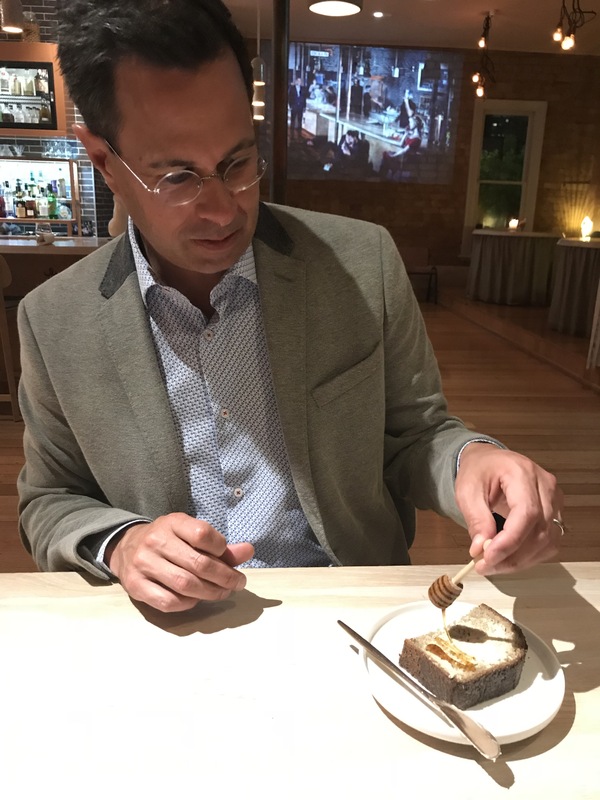 Vincent became involved in the conversation and incredibly swayed us to try the fried ice cream! 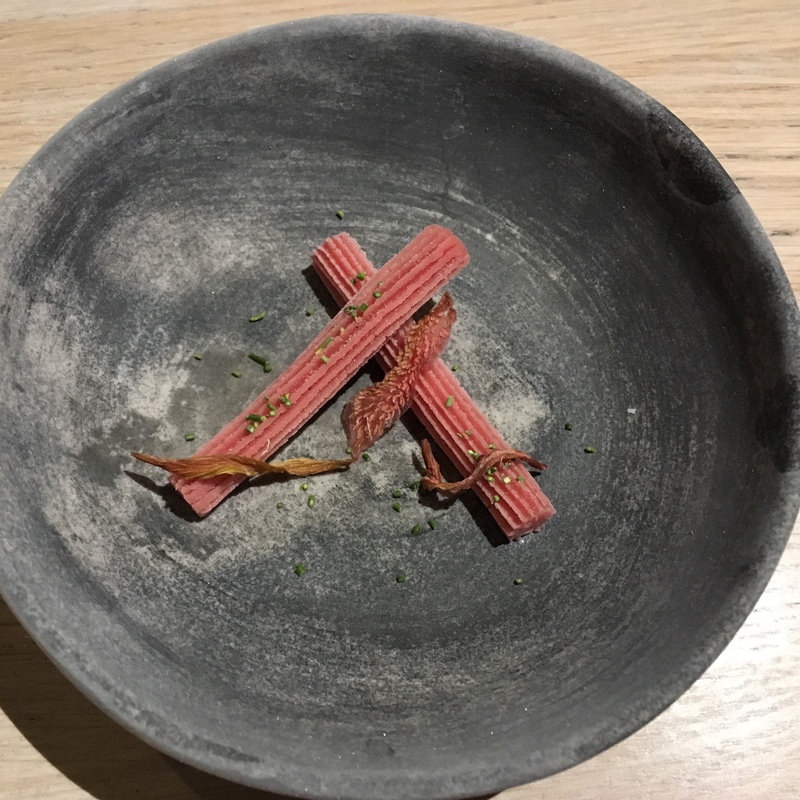 According to wiki the origin of this dessert is America, but to my mind it has become something of a suburban Chinese restaurant cringe dessert. Vincent was right. 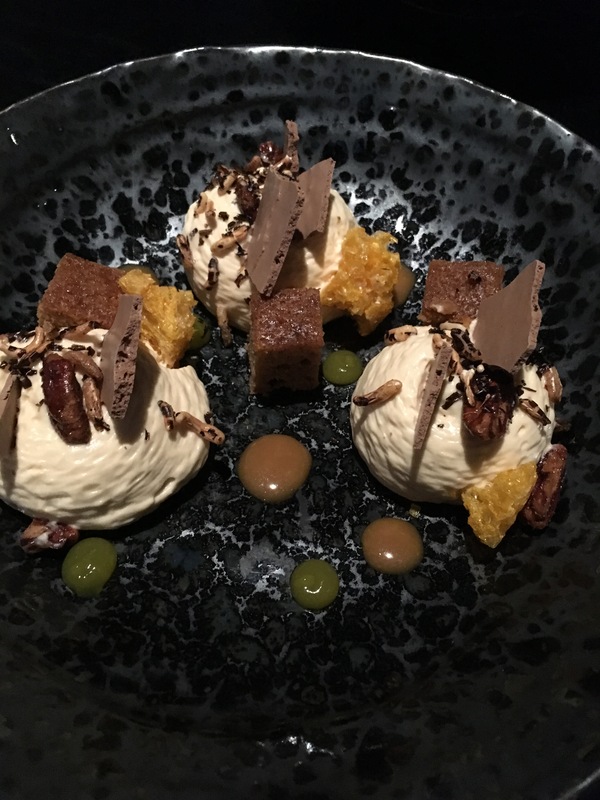 Not only did he realise we were going to share dessert (so organised for it to be split between our plates) but he was spot on that fried ice cream can be elevated to an adult dessert. This one is surrounded by sponge cake that has been compressed and then surrounded by breadcrumbs. It is complimented by a berry sauce and I will never say anything bad about fried ice cream again! The crepes are very nice, just as I remember them. Plenty of sweet mango filling, even though the season in Queensland has apparently come to an end. The hours had passed and all of a sudden the buzz in the restaurant had dissipated as one-by-one the guests had made their way back on to Market Lane. As I finished my Grandfather Port (yes, a traditional meal needs a traditional port!) and Catherine her Jasmine tea, we knew we’d had a night to remember. There is something comforting about Flower Drum, and there’s no need to feel guilty about it.